Available in 9 ft. and 13 ft. lengths, the Tour Links Training Aid is the best, all-in-one putting trainer ever developed. Tour Links Training Aids deliver positive feedback to all aspects of your stroke. Follow the club path down the String Guide. Maintain squareness at impact with the Stroke Groover Block. Improve your alignment with the Ball Marking Tool. Learn proper head and body position with the alignment Hash Mark. Create breaks with the Contour Mats and aim center cup with the Cup Reducing Ring. Suitable for left and right-hand golfers. This is the putting training aid pros and putting experts have relied on for years. With nearly 40 square feet of putting surface, this putting green is a golfer’s dream come true and is the first full size green that creates quality practice for golfers of any skill level. With room enough for two, the Par Saver delivers everything an enthusiast of the game demands. Club speed turf with adjustable breaks, and two regulation cups and pins are standard. This green is ready for use in any indoor or outdoor space. Molded from high impact polymers, the patented design makes installation a snap. Elevate your game to a new level with Tour Links! 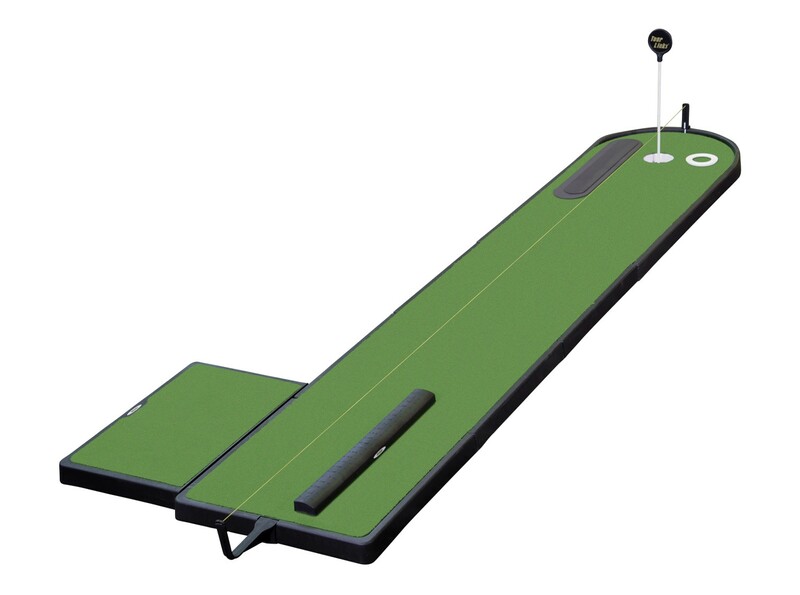 Never before could everyone own their own putting green for such an affordable price. Twelve feet long and six feet wide, this green will add charm to any indoor living space. This professional quality green has adjustable breaks and four regulation cups and pins. Molded from high impact polymers, the patented design makes installation a snap. Locate the perfect spot in your home and get ready to enjoy putting on your own private green! Plenty of room for several golfers. There is only one way to improve – practice, and there is only one way to practice – TourLinks! 14-foot putts on tournament speed turf make this green a must for any serious golfer looking to take his or her game to the next level. This putting green is as close to the real thing as you can get without being on the course. The Money Maker delivers all of the benefits, looks and class of a permanently installed green with the added-value of being able to expand it in the future or move it easily to another location. This professional quality green with adjustable breaks incorporates four regulation cups and pins. Solid feel, easy installation, common sense engineering. Practice made perfect! Creative Sport Concepts, Inc. (USA) PATENTS: U.S. PATENTS NOS. 7,930,865; 8,266,857; 6,302,803; 6,672,971; 6,672,970; 6,669,572; 6,793,586; 6,902,491; 7,516,587 and OTHER US AND FOREIGN PATENTS PENDING. NOTE THAT Creative Sport Concepts, Inc. HAS OTHER U.S. AND FOREIGN PATENTS PENDING FOR PRODUCTS AND MATERIALS OTHER THAN THOSE LISTED ABOVE.